The friendly skies were not so friendly on Sunday April 9, 2017. A passenger was dragged off a United Airlines flight from Chicago to Louisville after he refused to “volunteer” to leave. Passengers had already boarded and the flight was full, but the airline wanted 4 of its own employees to take the flight. The airline offered compensation of about $800, but understandably, no one volunteered to leave the plane. Volunteers were then chosen at “random” and coincidentally all happened to be Asian. The incident in question happened when a gentleman declined to leave, stating that he was a doctor and he had to make his flight as he had patients to see the following day. United Airlines employees called airport police and the man was forcibly removed. 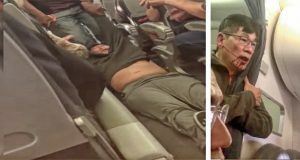 Videos have emerged showing that he was dragged screaming from his seat and his face was slammed into an armrest. He was dragged unconscious from the plane with blood on his face. The video is disturbing so proceed with caution. *Sigh. I’m not sure what the moral of the story is here. I was shocked at how this man was treated and I felt like this story needed to be shared. I thought United was an alright airline compared to some others we have to deal with here in the US, but this incident has changed my mind. The airline was at fault for “overbooking,” so the passenger should not have been penalized. The CEO and PR people added insult to injury by insinuating that the passenger should have allowed himself to be “re-accommodated.” I’m not sure why. We don’t get on planes just to hang out. We have places to be. The right time to “re-accommodate” is when passengers are waiting at the gate. I never even imagined a person could be remove from a flight after boarding for non-security reasons. And speaking of security, why were the airport police brought in? This was not a situation that warranted their presence. United owns fleets of airlines. Why not book the employees on another flight? Even offering more that $800 was a better solution than mistreating a passenger/customer. I assume he will sue and I hope he wins loads of money for his trouble. I am ticked off at the lack of humanity shown by the airline and the police. I wonder if I would have said something or done something if I had been there. None of the passengers stood up to defend the man. I wonder if I would have had the courage to do so. Regardless, thanks to the passengers who at least recorded the events. We have to hold these corporations responsible or they will get even more out of control. Vote with your wallet.